CAN'T SEE BIOS SCREEN, JUST GET BLANK SCREEN!!! Hello, I seem to be having a problem with viewing the UEFI BIOs on my motherboard. When I spam the delete button on boot up all I see is the ASUS logo and then a blank screen. I have managed to install windows so I do not think that there is a problem with the bios. In fact I am writing this message on the computer with the problem right now. I would like to know if there is anyway to fix this problem. By the way I am using an HDMI cable to connect my computer to my TV. Thank You for your time and any help that you may provide! I would start by resetting your bios settings to default; turn off your system, remove the side cover and gently pry out the board battery (round "button battery" such as cr2032). Leave it out for about one minute, and reinstall. Then see if you get a post screen. Follow directions and use one of the "f" keys to enter the bios. Set the smartfan setting (calibrate if you like; I use "quiet" mode), set your boot order, then save and exit. If you're actually able to load windows, then skip the bios reset and go into the bios using the "del" key and disable the asus logo screen; don't know where the setting is, but you'll find it. I also press the "pause" key to stop at the post screen when I want to view some info. Let me tell you what normally happens without me touching any buttons apart from the power button: I press the power button, then the ASUS splash screen shows up, after that Windows 7 Ultimate 64-bit loads and then I can sign into my account. Now here is what happens when I try to enter the bios: I press the power button, the ASUS splash screen shows, the splash screen tells me to press 'Del' to enter the BIOs, I press delete and then all I get is a black screen! That's a new one. I flashed my asus bios using a flash utility program I found in the "suite II" download. Check your bios file on the webpage for the latest file number; if you already have the latest version, no point in flashing. You may have to fill out a tech support request form with asus and let them handle it. Good luck. I know that I haven't got the latest BIOs, I just have the bios that came with the motherboard. I am too scared to update the BIOs myself. At the moment I have BIOs version 0906 and the latest is version 1302! Thank you for your help so far! Just to let you know, the reason I want to access the UEFI BIOs is o that I can change my memory clock speeds to 1600mhz and to possibly set a password for my UEFI BIOs! So if anyone knows how to do any of these things in Windows 7 Ultimate 64-bit please leave a comment! Hi, I have recently updated my UEFI BIOs to the latest. It is now gone from version 0906 to 1302, yet I still cannot see the UEFI BIOs screen. I find this very weird as I can still see the ASUS splash screen every time I boot up my computer. If anyone is reading this please may you help me. Exact same problem with new desktop. Waiting on a response from the seller but will let you know if a solution is forthcoming. My bios is now accessable after updating it to latest version. Went here http://support.asus.com/download/options.aspx?SLanguage=en&type=1 Once it's found your motherboard, choose the bios from dropdown & save it to your pc. Follow instructions to change the CAP file name. Download & install Asus AI SuiteII from Utilities dropdown on same page (or your Asus cd if you have one). Once the suite is installed & you've had a browse at the goodies, go to the update tab & update bios from the CAP file you recently stored on your pc (having remembered to do the name changing thingy on it). Watch with tight buttocks for around 3 mins & you're there. I have the same problem. My computer is connected to LCD TV via HDMI cable. But there is no problem (i can see EFI BIOS) when i connect my LCD monitor with VGA cable. Maybe is problem in UEFI BIOS screen resolution, or ...? The issue for you guys not getting a display is a handshaking problem between your GPU and monitor. The only resolution supported by UEFI is 1280X1024. If for some reason your GPU and TV/monitor don't handshake at that resolution, you'll see the splash screen but either get a garbled display or no display in UEFI. You'll also find you're fine when in Windows (for obvious reasons). There is no fix for this from our side. The GPU VBIOS and monitor native resolution are where the problem lies. If the display you've connected does not handshake correctly with the GPU for whatever reason, it will likely default to its native resolution, and if that's anything other than 1280X1024 you've got a problem displaying UEFI. This happens with some TVs, projectors and monitors with certain GPUs. Older displays are more likely candidates for such problems, as are very high res monitors that use new conections ( DP 1.2 daisy chaining two monitors can create problems) . I suspect a VBIOS update from the GPU vendor might help, but chances of GPU vendors making specific VBIOS versions for this are unlikely. Only workaround is to connect a display that allows you to see UEFI or try using another method of connecting the GPU to the display (DVI instead of HDMI for example). Obviously, the latter is not a guaranteed workaround, as it depends how the display and GPU handshake on that output, too. The problem appeared to be the TV I was using as when I plugged my computer into another, more expensive, TV my UEFI showed. Also my cheaper TV displays anything before windows at 720p, I guess that was the problem! Having a very similar problem stated above. Asus motherboard. Updated the BIOS to the latest ROM from Asus website using the Asus tool in the BIOS. Everything went as planned "so it seemed" upon reboot I pressed "TAB" to access POST message (I think). latest ROM did indeed flash so I restarted the computer and accessed the BIOS by hitting the DEL key. After hitting the DEL key I get a Black Screen. Every time I try to enter the BIOS. I can restart the computer and boot into windows just fine, but I can't access the BIOS anymore. Short the "CLEAR CMOS" jumper on your motherboard, assuming you have one (most motherboards do) to reset BIOS. Open your computer CPU case and look around your motherboard for a jumper labeled like this. These jumpers are usually located near the BIOS chip itself or near the CMOS battery. Yet another way to clear the CMOS is to reseat the CMOS battery. By removing and then reinstalling the CMOS battery, you remove the source of power that saves your computer's BIOS settings. If you can't access BIOS and also can't locate the clear CMOS jumper, clearing the CMOS this way should do the trick. I had this problem and found a work around. Running SLI, I have my DVI connector plugged into GPU 2 since this receives more airflow and is a more appropriate master GPU. Connecting the DVI plug to GPU 1 allowed me to access the BIOS. Just as a side note I was having a similar issue after a build but I was getting just a blank screen entirely (but I could hear it posting fine with the beeps). The monitor I use for doing builds/computer work is RGB and on a whim I decided to hookup my DVI (motherboard has an onboard GPU with both of those connections). Well there it was. For some reason it was defaulting to the DVI but maybe because the RGB monitor only supports 1366x768 it was something like the poster above described with the UEFI not handshaking? I have same problem with my Asrock motherboard and Nvidia graphic card. I have TV conected to HDMI port in nvidia and monitor to DVI port in nvidia. UEFI screen is displayed on HDMI before DVI even when TV is turn off. I dont know how change pririty. When I disconect TV from graphic card and I have only monitor conected to DVI port the uefi screen is properly displayed on monitor. First of all, I wanted to point everyone's attention to raja@asus's posts in this same thread. It seems like not many people have read it and simply took it for granted. It helped me for sure, it helped me to realize absolutely nothing is wrong with my video card, nor with LED monitor (BENQ), nor anything else... it's simply about those "handshakes". His post made me experiment with my monitor's settings... and guess what? I found solution for my problem. My BIOS splash screen is always visible now. When my PC was connected through HDMI, I have never ever had any trouble seeing BIOS splash screen. Since I have to use this same monitor for my PS4 and my PC, but PS4 only has HDMI out, I had to use HDMI port on my monitor for PS4. So, the only connector that's left unused, is DVI-D for my PC. I'd rather have them connected like that, instead of constantly unplugging HDMI cable and switching from PS4 to PC. All good, but as soon as I reset my PC, I was never able to see my BIOS splash screen. I guess HDMI and DVI-D were fighting as to who is going to have first "handshake" with my monitor. 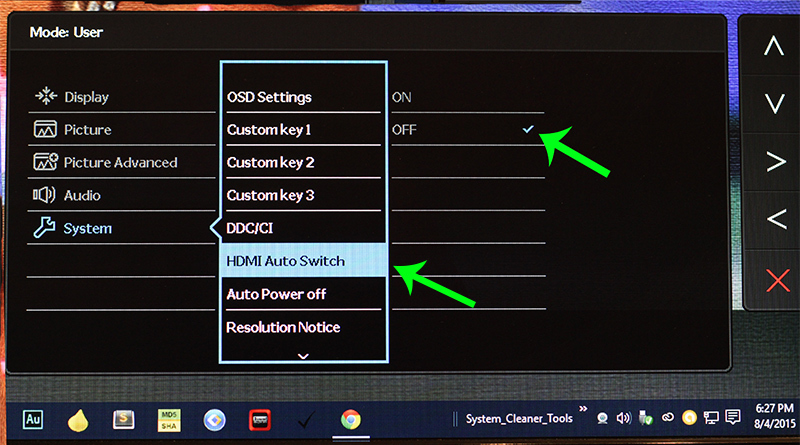 Simple thing I did in my monitor settings that solved all my problems - "HDMI Auto Switch" option set to OFF. Voila! Both, my HDMI and DVI-D connections work perfectly fine. When I reboot, I see my BIOS splash screen. I have this problem and i think you just explained in so much detail what is going on to me. I can't thank you enough for the help! Kind of strange; not like other peoples problems. - When I boot normally or fast I get a "no signal" warning from my monitor. But I does boot the OS - but I'm not able to access UEFI BIOS. When I try with the BIOS key - I only stay in a black screen. - When I booted to windows and do a reboot then the UEFI BIOS shows up and I'm able to access it without problem. Until now I didn't try to do a Clear CMOS and I run the latest UEFI BIOS for my board 1603. Have you tried my solution that solved my problem? Maybe it would work in your case too. Do you mean the HDMI Autoswitch Option? I'm connected to Display Port - not to HDMI -> and there is no HDMI Autoswitch function on my screen. AND: if you do a "Reboot" from windows - automatically shutdown and start new (cycle) then the UEFI/BIOS screen shows up... that's so strange. Yes, it's strange it acts that way and everything is perfectly fine when restarting Windows. I hope someone will finally find some solution. No problem, thx for your help. I assume it is related to the graphic card, not to the monitor. The strange thing is, the monitor gets a kick and starts when I boot the PC. But after one or two seconds it says, that there is no signal and stays black. when I then try to push the bios button severeal times the motherboard code "b4" odr "64" shows up for around 5sec and then it boots to the OS by normal boot (not fast boot). --> Found Workaround for getting in BIOS: Manually wake up my monitor screen, then start PC -> BIOS available! Question CPU PINS CAUSE NO VIDEO SIGNAL?! Blank screen, Mobo or Cpu issue?